This weekend was great for being rejected. On Saturday alone I missed my chance at 1 million dollars and was "this close" to performing live on Broadway for my first time ever. Saturday I got the postcard in the mail which would tell me if I was going to be on the show or not. I shall attempt it again soon, and next time during the interview I'll try to be interesting. I'm sure they'd love to hear about my attempt to get on Broadway! Saturday, Rachel and I were in the city trying to get cheep Broadway tickets. "Wicked" has a lottery the day of shows that allows the winners to by 26 dollar tickets for horrible seating. We did not win the lottery. But right next door is another show called "The 25th Annual Putnam County Spelling Bee." They have a lottery too... which we also didn't win. But one group of people ended up winning so many tickets that they didn't need two of them, so we did end up seeing the musical! It turns out that "Spelling Bee" interviews and selects four people to be on stage during much of the performance. The interviews occur before the performance starts, so Rachel and I both were interviewed... and we weren't selected. The show was funny at times. And the lines the people were instructed to give were typical of spelling bees. Judge (who happened to be Mo Rocca, sitting two feet away from me since we were practically sitting on stage): "Your word is: 'cow'." Audience member selected for cast: "Can you give the definition?" Audience member: "Can you use it in a sentence?" 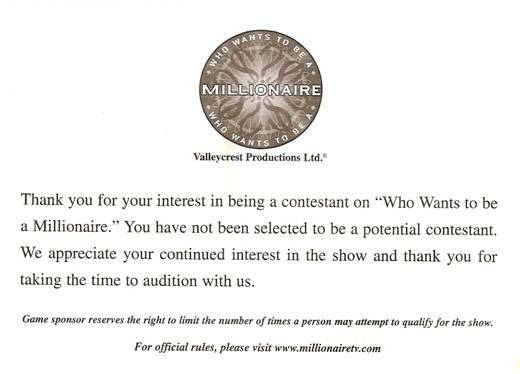 Anyhoo, I just missed being a Broadway star, but hopefully my near miss will be enough of a story to earn me moolah on Millionaire.